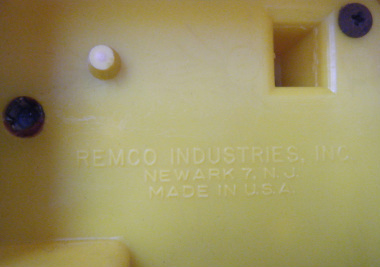 Remco produced a number of different telephones and walkie-talkies in the 1950's and 1960's. 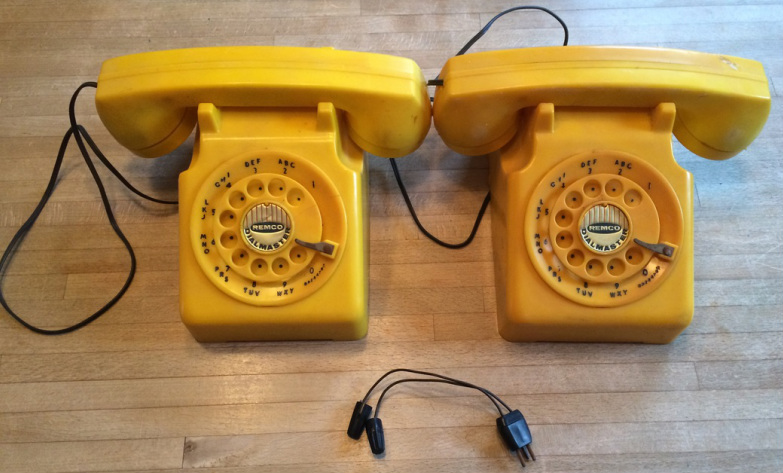 My sister acquired a pair of yellow phones from eBay and asked me to see if I could get them operational. As of this posting, I have the ringers working, but no voice transmission. Next time I see my sister, I will give the mouthpieces a bit of a shake-up to free the carbon particles that are critical for speech transmission. Update: I got about 1/2 an hour today to work on the phones again. I tapped around the rim of the mouth pieces with a tiny mallet and reconnected the phones. I could hear clicking in the earpiece when the phone was dialed. By a trial and error process, my sister and I discovered that by rotating the dials through about 4 digits and holding them there we could communicate quite clearly. Next time I work on the phones I will need to open them up again in an attempt to discover why they have a "sweet spot" for communicating and see if it can be adjusted to be independent of rotating the dials. The phones as they came out of the shipping box from the eBay purchase. 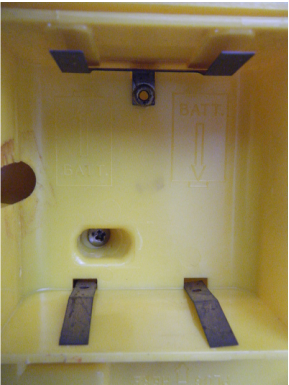 When the handset is removed, the pushbutton in the cradle is revealed. 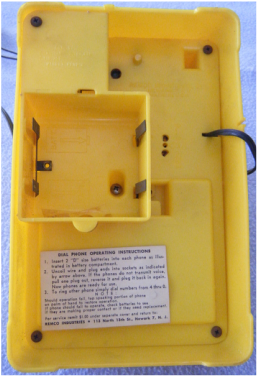 The bottom of the phone houses the batteries, the instructions, and the jack for the connector leading to the second phone. Marking on the bottom of the phone list the manufacturer as well as the patent numbers (not shown). The phones came with only one jack which means I will have to make another one. I don't believe the wire nuts came with the phone. I would guess the original hookup wire was cut to length and the wire nuts were used to splice on the jack. The handset feels just like the real deal. 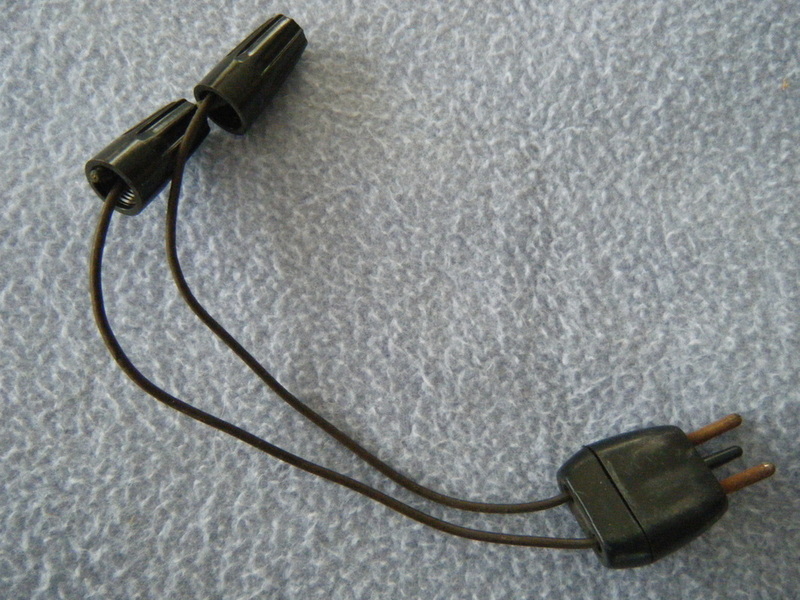 Close-up of the earpiece. The surface is a bit spotty but I think it is still functional. 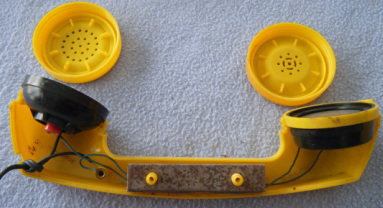 This is a good view of the inner workings of the handset. The knot in the wire acts as a strain relief - it keeps the user from tugging on the wire connections. 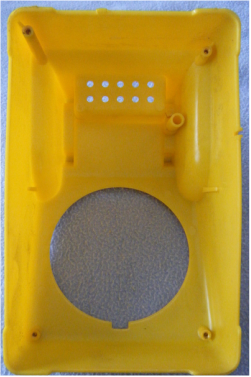 The middle of the handset has 3 metal bars mounted over plastic risers. The pieces were clanging about. When we opened the handset we found that they were originally spaced apart with rubber bands. We replaced the rotted rubber bands with felt strips. The bars give the handset some heft but also hold the button in the cradle down - which switches between ringer mode and speaking mode. This is the inside of the top portion of the phone. 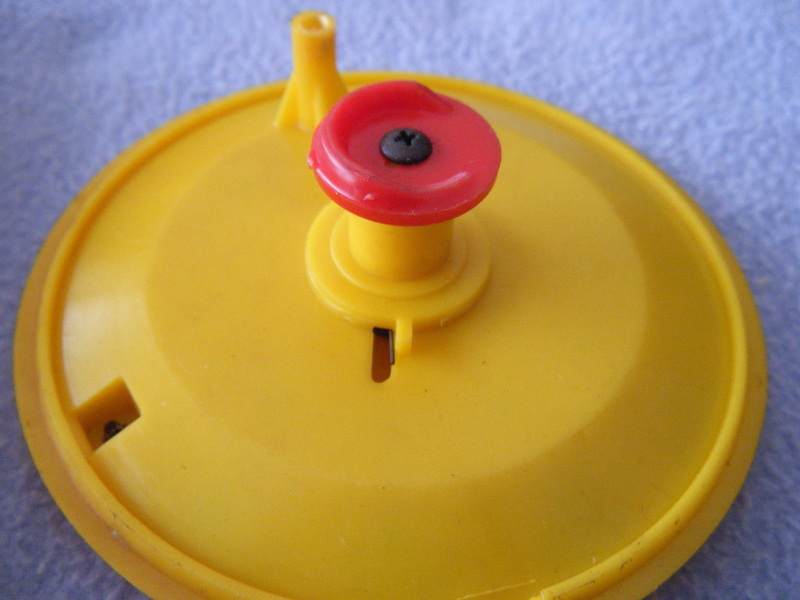 The large notched hole is for mounting the dial. 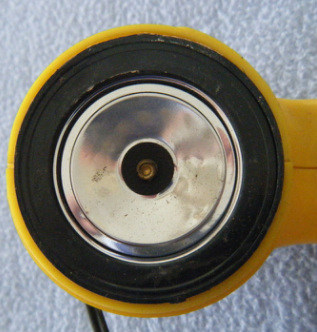 The series of smaller holes are the speaker grille for the ringer. 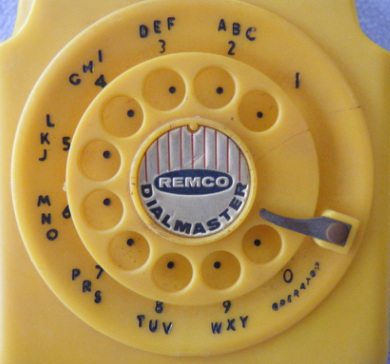 The dial doesn't make use of the phone numbers but it does have a cam that pushes a contact that makes the ringer work. This is the heart of the phone. It contains two switches. One is just to the left of center. It gets pushed down by the cam on the dial. The second is associated with the dimpled metal tab in the upper left hand corner. It gets pushed down by the button in the cradle. Picking up the handset and turning the dial on one phone will cause the ringer on the second phone to go off. Both phones rattled when we got them. When we opened them up a black plastic strip fell out of each phone along with dried fragments of cellophane tape. I could not find a location for the pieces. The piece was exactly the right size to cover the spring contacts so I taped them there. 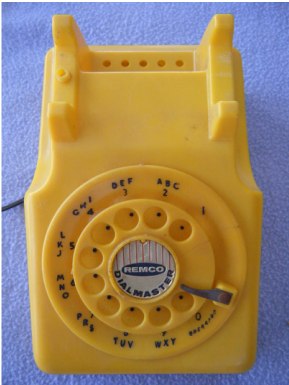 When we tried using the phones the batteries kept falling out. It was then that I realized that the plastic was intended to be a battery clip. The previous owner had pushed the clips inside the phones and taped over the holes to keep the clips from falling out and getting lost. 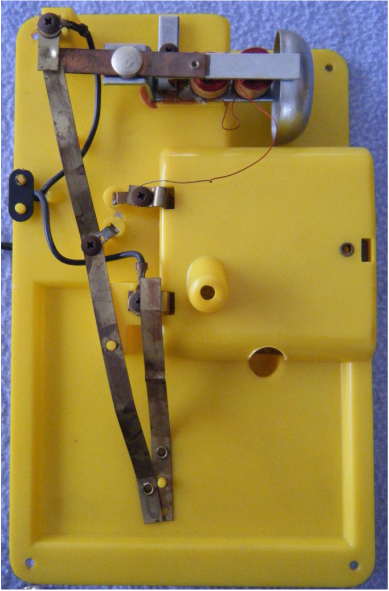 The dial action is very similar to a real rotary phone except it doesn't make the whirring sound. 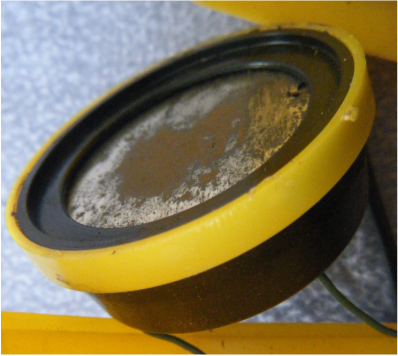 The battery contacts aren't corroded with battery acid but they do need burnishing. 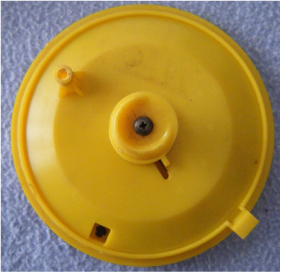 The screw in the battery compartment holds the dial in place. 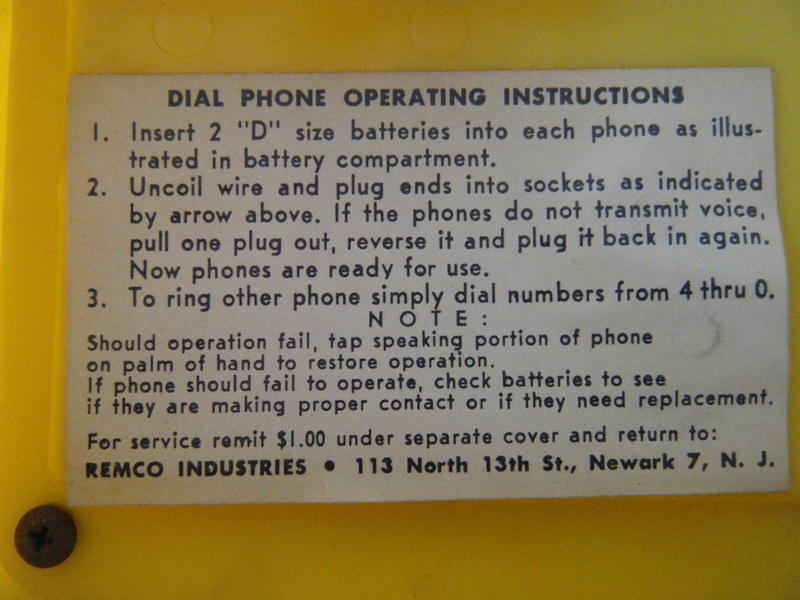 The operating instructions are glued to the bottom of the phone. This is close-up of the jack. 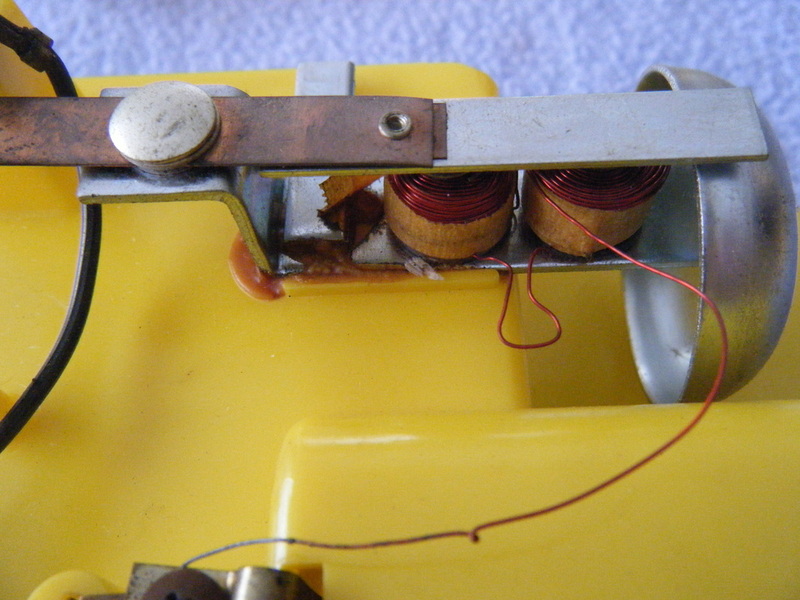 The two outer pins were rusty and needed serious cleaning. 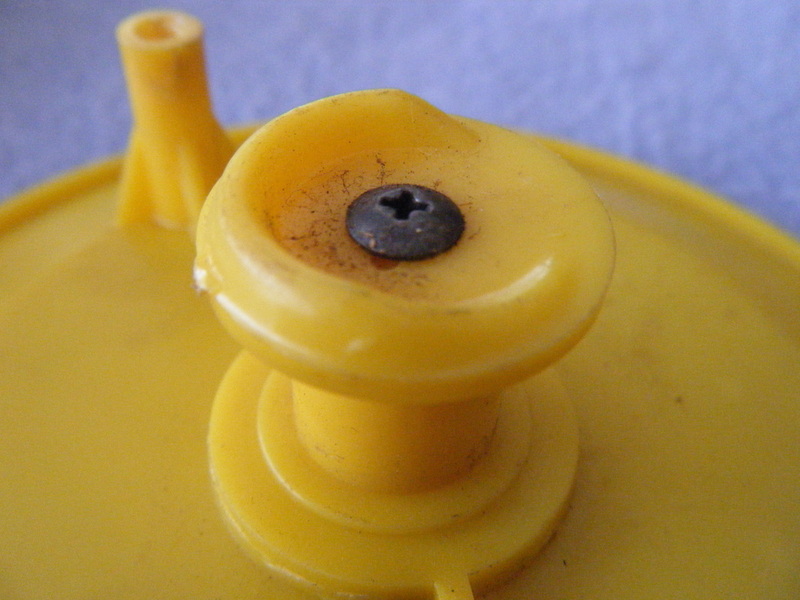 The middle pin is just a plastic locator. One of the patents is for the design of this connector. The mouthpiece and the earpiece screw on. Once they are unscrewed handset splits in half. This is the mouthpiece unit. 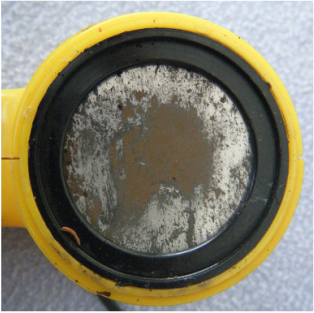 I now believe the reason that the phones are not working is because the carbon particles inside this unit have settled or caked up while the unit was in storage. 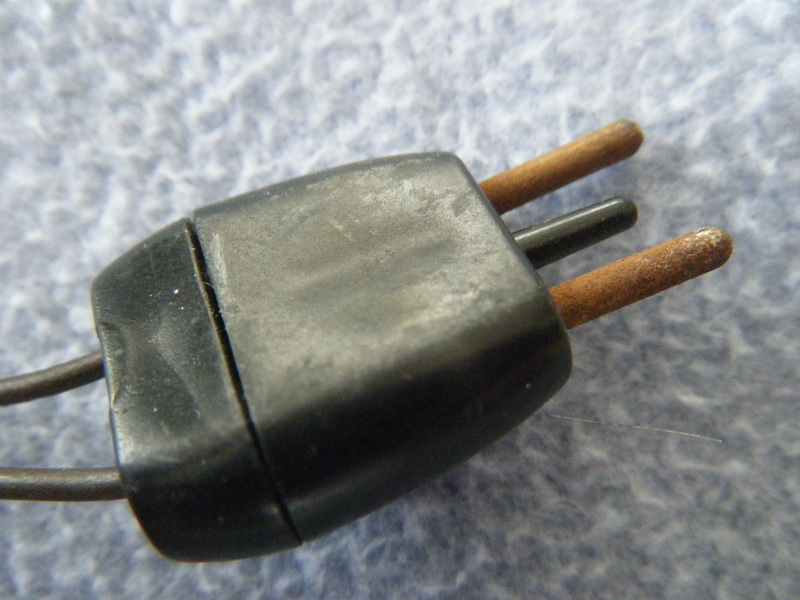 This is the earpiece when removed from the handset. 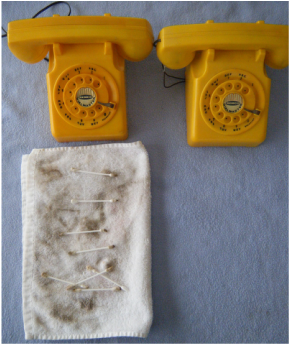 The phones were quite dirty inside and out. My sister used doll cleaning supplies to remove the grime. The richer orange phone above the cleaning supplies has been cleaned. The faded phone on the right had not yet been cleaned. The back of the dial unit. A coil spring resides below the central shaft and provides the return motion when the dial is rotated. When we opened the second phone we were surprised to see that the cam was red. The phone units also came in red - an assembler must have grabbed a wrong piece. Close-up of the spring contact that gets pushed down onto the screw with the wire attached when the cam on the dial does its thing. 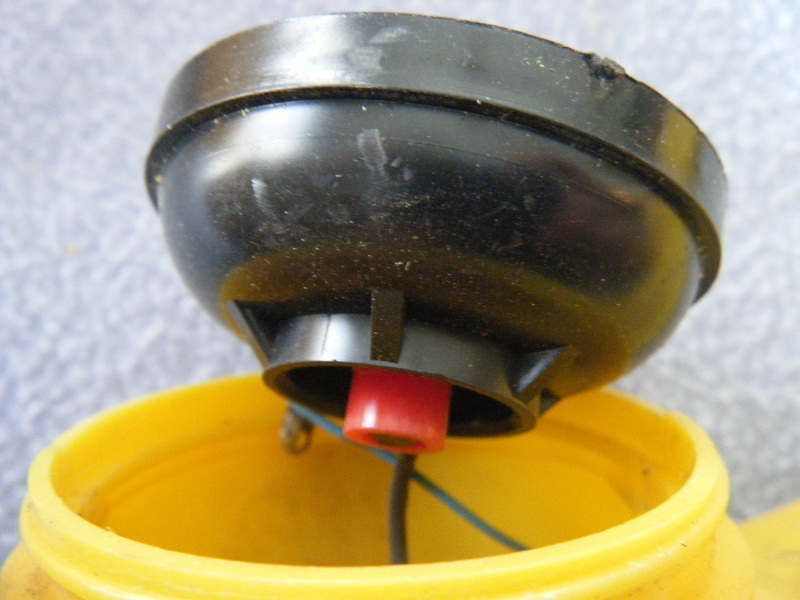 The dome shaped bell on the right is struck by the flat clapper when the two electromagnet coils are powered up. The ringers worked great once all the contacts were cleaned up. 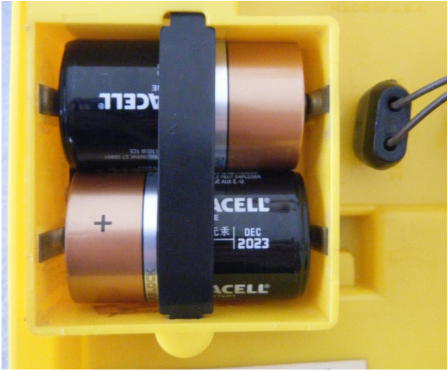 This photo shows the batteries properly secured with the mystery piece. 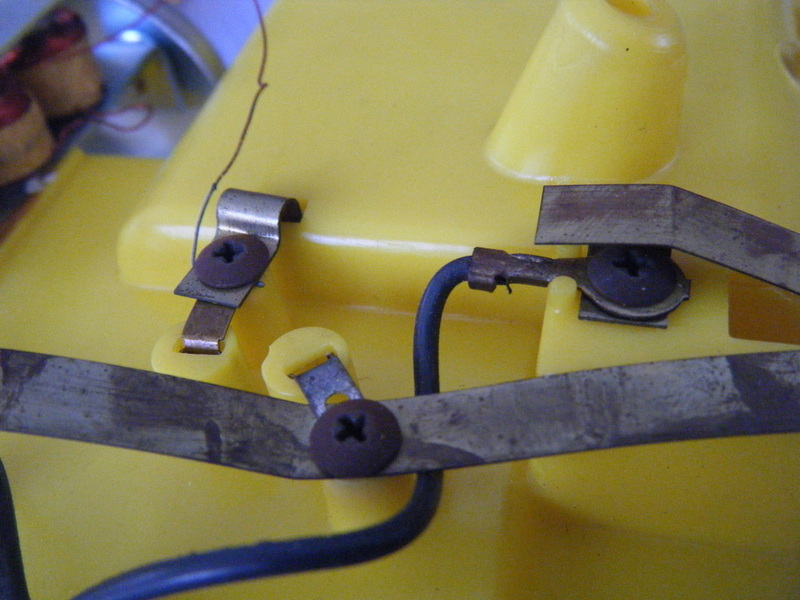 The installed wiring jack is visible on the right.